Is it just us, or are plain old fish bowls kinda boring? Sure, they totally take us back to winning a gold fish at the local fair when we were kids — but, bottom line is, a fish bowl is not really decent home decor. But if you add a betta fish, a little color with some stones and a flourishing lily plant, well, then you’ve got something special. And you can totally DIY your way to a cool looking lily aquarium to showcase in your living room or kitchen. Here’s how. The most important thing to consider when choosing the vase is the well-being of your fish. Choose a container that’s too small, and you limit the amount of space the fish has to swim in. Betta fish need enough room to swim around and don’t do as well in really small bowls. Some pet stores sell fish bowls that will work fine for this purpose. The container you choose should have a neck that isn’t too narrow and a bowl that holds a quart of water or more. Do not use a glass container that is made from lead crystal, since it may leach into the water and be harmful to your fish. Add a layer of colorful rocks, seashells, gravel or glass marbles at the bottom of the bowl for added color, making sure not to take up too much room. Your fish will appreciate extra room to move. Choose a peace lily that isn’t very large, but has a well-developed root structure. Since the roots will be dangling down into the fish bowl, they should take up no more than about 20 percent of the space to allow your fish ample swimming room. The lily that you choose should be smaller in diameter than the opening of the fish bowl in order to allow enough air into the bowl. Remove the lily from the pot and shake gently to dislodge the extra soil from the roots. Rinse under running water for a few minutes to remove all traces of soil before you place the lily into the fish bowl. 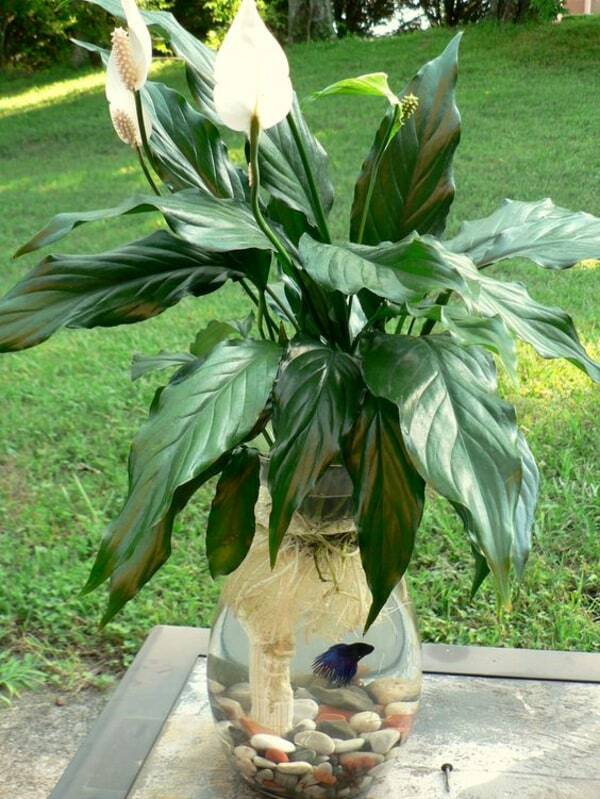 In order to properly support the peace lily, you will need a lid that fits neatly into the opening of the fish bowl. You can use a plastic plant tray, trimmed down to the proper size, or any material you can easily cut. An X-Acto knife makes cutting the plastic easy. Cut an opening in the center of the plastic that is large enough for the roots of the lily to dangle through. Bettas are a type of labyrinth fish, which means they must breathe oxygen from the surface in order to survive. In addition to cutting an opening in the center of the plastic, add additional holes all around the tray to ensure proper air circulation. After securing the lily in the center hole, you can add a few colorful stones to the lid to match those on the bottom of the bowl. Fill the bowl with water, leaving several inches of space between the top of the water and the opening for sufficient air flow. Use dechlorinating drops in the water to remove any chlorine that might harm the fish. Betta fish — also known as Siamese fighting fish — come in beautiful, bright colors. Choose a fish that swims well, appears alert and healthy and is not too large for the container you have selected. In order to keep your Betta fish healthy, change the water in the bowl at least once a week, taking care to also rinse the roots of the lily. Betta fish should eat twice a day and can eat Betta flakes, pellets or freeze-dried blood worms. You may be able to use a small funnel or straw to insert the food through a hole in the lid. It is a myth that the Betta fish will eat the plant material from the lily — they need regular food and care to stay happy and healthy. 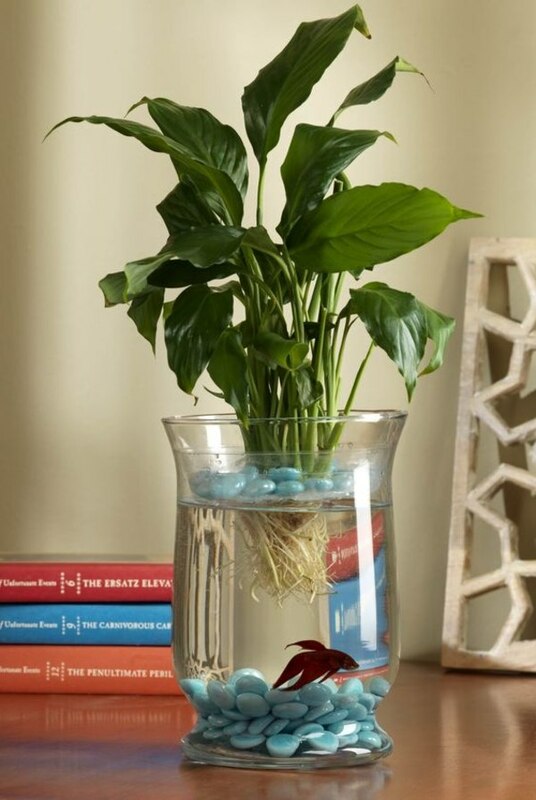 There has been some controversy surrounding the practice of growing a peace lily in a bowl with a Betta fish. 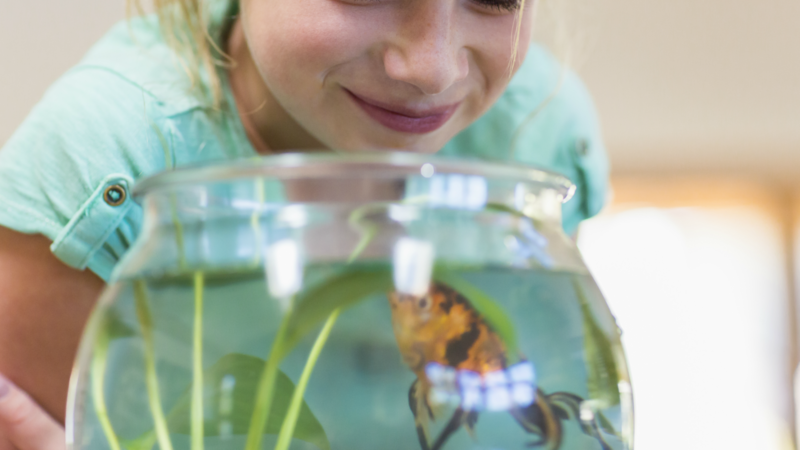 Take care to ensure that your Betta fish has plenty of room to swim around the roots and enough space to rise to the surface for oxygen in order to keep your new pet healthy. Originally posted July 2012. Updated September 2017.